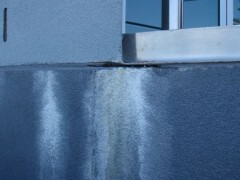 Secondary efflorescence due to free water of a cementitous material allows soluble salts to migrate to the surface, with the free water evaporating forming insoluble salts (efflorescence). Ceramic tiles, stone and pavers are generally laid on concrete or leveling screeds that are of a cementitous material which include the constituents of efflorescence. These cementitous products are an abundant source of calcium hydroxide [Ca(OH)2] which is formed during the cement hydration process. 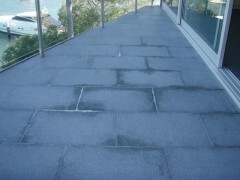 The presence of free water such as rain may penetrate through the grout lines or into the ceramic tiles, stone and pavers may then dissolve the calcium hydroxide. If this salt water is then allowed to evaporate over time, the soluble calcium hydroxide may react with the carbon dioxide (CO2) in the air, forming an insoluble calcium carbonate (CaCO3) that forms the efflorescence. It is at these places of evaporation that high levels of the white coloured efflorescence are observed. Masonary and stone pavers may also be tested to determine their propensity to migrate salt laden solution and form efflorescence at the surface. The pavers and stone are partially submersed into a salt solution and observed over time to assess how any efflorescence and the extent. Safe Environments conduct efflorescence testing to AS/NZS 4456.6 Masonry units and segmental pavers and flags – Methods of test – Determining potential to effloresce. How to Prevent and Mitigate Efflorescence? Ensuring adequate substrate drainage to prevent salt laden water from evaporating.